Diabetic kidney disease not only has become the leading cause for ESRD worldwide but also, highly contributes to increased cardiovascular morbidity and mortality in type 2 diabetes. Despite increased efforts to optimize renal and cardiovascular risk factors, like hyperglycemia, hypertension, obesity, and dyslipidemia, they are often insufficiently controlled in clinical practice. Although current drug interventions mostly target a single risk factor, more substantial improvements of renal and cardiovascular outcomes can be expected when multiple factors are improved simultaneously. Sodium-glucose cotransporter type 2 in the renal proximal tubule reabsorbs approximately 90% of filtered glucose. In type 2 diabetes, the maladaptive upregulation of sodium-glucose cotransporter type 2 contributes to the maintenance of hyperglycemia. Inhibiting these transporters has been shown to effectively improve glycemic control through inducing glycosuria and is generally well tolerated, although patients experience more genital infections. In addition, sodium-glucose cotransporter type 2 inhibitors favorably affect body weight, BP, serum uric acid, and glomerular hyperfiltration. Interestingly, in the recently reported first cardiovascular safety trial with a sodium-glucose cotransporter type 2 inhibitor, empagliflozin improved both renal and cardiovascular outcomes in patients with type 2 diabetes and established cardiovascular disease. Because the benefits were seen rapidly after initiation of therapy and other glucose-lowering agents, with the exception of liraglutide and semaglutide, have not been able to improve cardiovascular outcome, these observations are most likely explained by effects beyond glucose lowering. 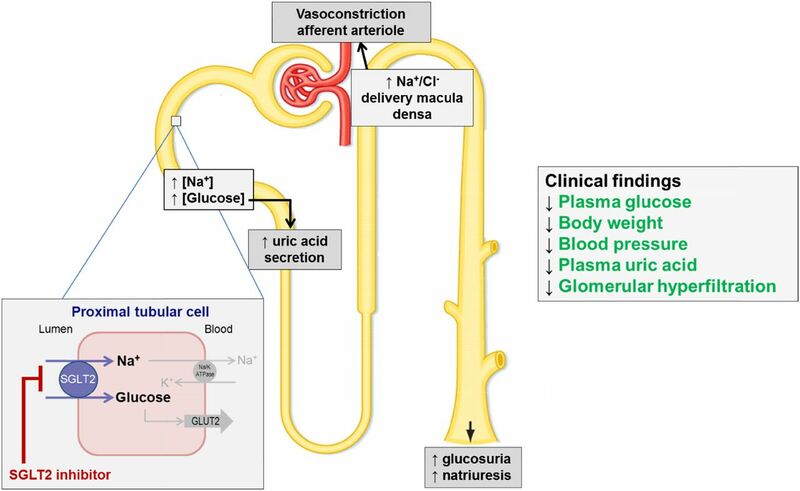 In this mini review, we present the drug class of sodium-glucose cotransporter type 2 inhibitors, elaborate on currently available renal and cardiovascular outcome data, and discuss how the effects of these agents on renal physiology may explain the data. The increased risk for (micro)vascular complications in type 2 diabetes (T2D), including diabetic kidney disease (DKD), cannot be explained by chronic hyperglycemia alone but involves other risk factors, like obesity, systemic hypertension, and dyslipidemia (1). Despite intensified lifestyle and pharmacologic interventions (e.g., antihyperglycemic agents, statins, and antihypertensives, especially renin-angiotensin system [RAS] blockers) to strictly control these risk factors, the prevalence of DKD continues to rise and has become the leading cause for ESRD worldwide (1,2). Moreover, DKD is strongly associated with cardiovascular disease (CVD) and increases 10-year mortality from 12% in patients with T2D without DKD to 31% in patients with DKD (3). Several novel therapeutic strategies, like dual/triple RAS blockade and sulodexide and bardoxolone therapy, have been explored to further improve renal outcome in diabetes. However, these approaches were either ineffective or harmful, indicating that other avenues should be explored. Although current drug development is largely on the basis of the modification of one risk factor, a single drug that simultaneously improves multiple risk factors in T2D may lead to more salutary renal and cardiovascular outcomes, especially because they are often insufficiently controlled in clinical practice (4). The recently introduced selective sodium-glucose cotransporter type 2 (SGLT2) inhibitors improve glycemic control in an insulin-independent manner by blocking glucose reabsorption in the renal proximal tubule, thereby enhancing urinary glucose excretion. SGLT2 inhibitors exert multiple beneficial effects, including reductions in body weight and serum uric acid (SUA) as well as BP lowering and attenuation of glomerular hyperfiltration, which are likely linked to glycosuria-accompanied natriuresis. Collectively, these actions beyond glucose lowering may help to explain the observed renal and cardiovascular benefits of the SGLT2 inhibitor empagliflozin in the large-sized randomized, placebo-controlled cardiovascular outcome trial of empaglifozin (EMPA-REG OUTCOME) (5,6). Here, we review the mechanism of action and glucose-lowering efficacy of SGLT2 inhibitors, discuss their reported renal benefits in T2D, and address mechanisms beyond glucose lowering by which these benefits may be explained. We will not discuss the importance of renal risk factors in DKD per se or the cardiovascular outcome of the EMPA-REG OUTCOME Trial in detail, because they have been extensively covered in recent literature (1,7). The kidney has an important role in glucose homeostasis through glucose utilization, gluconeogenesis, and tubular glucose reabsorption. In healthy individuals, the kidney accounts for 20%–25% of endogenous glucose production in the fasting state, which increases to about 60% postprandially (8). Furthermore, 180 L plasma is filtered through the glomerulus per 24 hours, meaning that, in individuals with a mean plasma glucose concentration of 100 mg/dl (5.6 mmol/L), 180 g glucose is normally filtered, completely reabsorbed, and returned to the circulation each day. Two transporters that appear sequentially in the proximal tubule are responsible for glucose reabsorption from the filtrate: (1) the high-affinity, low-capacity SGLT2, which couples sodium to glucose reabsorption with a 1:1 stoichiometry in the early (S1) proximal tubule, and (2) the low-affinity, high-capacity SGLT1 in the more distal part (S2/S3) (9). SGLT2 normally accounts for approximately 90% of glucose reabsorption, whereas SGLT1 accounts for the remaining 10% (9). In T2D, renal changes contribute to the maintenance of hyperglycemia. First, renal gluconeogenesis is increased threefold in this population (8). Second, the maximum reabsorptive capacity for glucose is increased by 30% in T2D (10), whereas the threshold for plasma glucose at which glycosuria first occurs is also raised (10). These latter changes are paralleled by a fourfold upregulation of SGLT2 (and the basolateral facilitative glucose transporter [GLUT2]) expression (11). On the basis of observations that SGLT2 gene mutations lead to benign glycosuria (familial renal glycosuria) (12) and that pharmacologic blockage of SGLTs effectively reduces plasma glucose in animals with diabetes (13), the proximal tubule of the kidney was targeted to achieve glycemic control in human diabetes. For this, specific SGLT2 inhibitors were developed, because additional SGLT1 inhibition, achieved with the first natural compound phlorizin, provoked intolerable gastrointestinal side effects. Currently, three oral SGLT2 inhibitors (i.e., canagliflozin, dapagliflozin, and empagliflozin) are approved by the US Food and Drug Administration (FDA) and the European Medicines Agency (EMA) for patients with T2D and an eGFR>30 ml/min per 1.73 m2, and they are considered reasonable options as second- or third-line antihyperglycemic treatment (2). In a meta-analysis of 45 clinical trials including 11,232 patients with T2D and baseline hemoglobin A1c (HbA1c) of 6.9%–9.2% and excluding severe renal impairment, SGLT2 inhibitors effectively reduced HbA1c by 0.79% when used as monotherapy and 0.61% when used as add-on therapy compared with placebo (14). More compounds within this drug class are in global or regional development (Table 1). The glucose-lowering mechanism of SGLT2 inhibitors has been detailed in a proof of principle study in patients with well controlled T2D and normal renal function (10). Seven days of dapagliflozin treatment reduced the calculated renal threshold for plasma glucose from 196 to 22 mg/dl (10.9–1.2 mmol/L) (10). Notably, the glucose-lowering efficacy of SGLT2 inhibitors is directly related to the filtered glucose load and thus, is related to not only the degree of hyperglycemia but also, GFR (15), which explains the reduced glucose-lowering efficacy in patients with T2D and reduced kidney function (Figure 1) (16–18). Interestingly, SGLT2 inhibitor–associated urinary glucose excretion in patients with a normal GFR is only about 60–80 g/d, which is markedly less than can be expected given the complete inhibition of SGLT2 (9). Evident increases in SGLT1-mediated glucose reabsorption account for the 50%–60% of renal glucose reabsorption that persists (9). Other factors also reduce the glucose-lowering efficacy of SGLT2 inhibition, including SGLT2 inhibitor–induced reductions in insulin and increments in glucagon levels, thereby enhancing endogenous glucose production (19). Glucose lowering efficacy the SGLT-2 inhibitors dapagliflozin (10 mg once-daily) is reduced with declining eGFR. This graph represents pooled data from monotherapy as well as add-on therapy studies in patients with type 2 diabetes. Dapagliflozin leads to a lesser placebo-corrected reduction in HbA1c in patients with moderate renal impairment (eGFR ≥30 and <60 mL/min per 1.73 m2) at baseline. Similar effects have been observed with canagliflozin (17) and empagliflozin (18). 95% CI, 95% confidence interval; HbA1c, hemoglobin A1c. Modified from ref. 51, with permission. The first in class EMPA-REG OUTCOME Trial, which was designed according to the 2008 US FDA regulations to assess cardiovascular safety and not benefit, compared two doses of empagliflozin (10 and 25 mg/d) with placebo on cardiovascular events in 7020 patients with T2D, established CVD, and eGFR>30 ml/min per 1.73 m2 (Tables 2 and 3) (6). After a median follow-up of 3.1 years, empagliflozin significantly (albeit by a small margin) improved the occurrence of the primary major adverse cardiovascular event outcome of the trial (cardiovascular death, nonfatal myocardial infarction, and nonfatal stroke) by 14% compared with placebo (hazard ratio [HR], 0.86; 95% confidence interval [95% CI], 0.74 to 0.99; P=0.04), which was mainly driven by a significant 38% reduction in cardiovascular death (HR, 0.62; 95% CI, 0.49 to 077; P<0.001) (6). A nonsignificant 13% reduction in nonfatal myocardial infarction and a 24% nonsignificant increase in nonfatal stroke were observed in the empagliflozin group. Added to the facts that cardiovascular benefit occurred too early (i.e., within months) to be explained by antiatherosclerotic effects and that there was a substantial reduction in hospitalizations for heart failure (HR, 0.65; 95% CI, 0.50 to 0.85; P=0.002) makes empagliflozin-induced hemodynamic changes a likely explanation for the observed benefit. Furthermore, empagliflozin-treated patients (pooled doses) had an HR of 0.61 (95% CI, 0.53 to 0.70; P<0.001) for the secondary renal outcome of new-onset or worsening of nephropathy (consisting of progression to macroalbuminuria, doubling of serum creatinine accompanied by an eGFR of ≤45 ml/min per 1.73 m2, initiation of RRT, or renal death) compared with placebo. The HR was 0.54 (95% CI, 0.40 to 0.75; P<0.001) when progression to macroalbuminuria, which may be explained by a concomitant reduction in eGFR, was excluded from the analysis (5). The individual components progression to macroalbuminuria, doubling of serum creatinine accompanied by eGFR of ≤45 ml/min per 1.73 m2, and initiation of RRT were significantly reduced (Table 3). However, renal death (three with empagliflozin versus zero with placebo) and incident microalbuminuria (HR, 0.95; 95% CI, 0.87 to 1.04; P<0.25) were not affected. Furthermore, because doubling of serum creatinine did not have to be confirmed after a predefined period of time by an additional measurement and the initiation of RRT did not exclude temporary dialysis, discussion has been raised about whether these end points necessarily represented irreversible nephropathy progression (20). Interestingly, a recent meta-analysis of regulatory submissions made to United States, European Union, and Japanese drug agencies and 57 prospective randomized, controlled trials (70,910 patients) found that seven different SGLT2 inhibitors all reduced the relative risk (RR) for major adverse cardiovascular events by 16% (95% CI, 5% to 25%; P=0.001) (21). Although this indicates a favorable class effect, it should be noted that the EMPA-REG OUTCOME Trial accounted for the majority of cardiovascular events in this analysis. The benefit of other SGLT2 inhibitors on renal and cardiovascular outcome should thus be confirmed in ongoing dedicated trials (Tables 2 and 3). Although improved glycemic control with empagliflozin could have contributed to the observed renal and cardiovascular benefits, the small HbA1c reductions in the EMPA-REG OUTCOME Trial (0.45% at 90 weeks and 0.28% at 204 weeks compared with placebo) are unlikely to explain the rapid onset and effect size, especially because no other glucose-lowering agent, except liraglutide and semaglutide in the recently published Liraglutide Effect and Action in Diabetes: Evaluation of Cardiovascular Outcome Results (LEADER) Trial and the Trial to Evaluate Cardiovascular and Other Long-Term Outcomes with Semaglutide in Subjects with Type 2 Diabetes (SUSTAIN-6) (22), has shown to improve cardiovascular outcome (6). Therefore, mechanisms beyond glucose lowering are most probably involved (Figure 2). The SGLT2 inhibitors affect multiple sites in the diabetic kidney. This figure summarizes the effect that SGLT2 inhibition has on an individual nephron, which in turn, improves different renal risk factors in type 2 diabetes. ATPase, adenosine triphosphatase; GLUT2, glucose transporter 2. Reducing body weight in T2D favorably affects various renal and cardiovascular risk factors and quality of life but did not improve cardiovascular morbidity and mortality in the Look AHEAD (Action for Health in Diabetes) Study (23). However, a post hoc analysis of this lifestyle intervention trial showed that the 2.5% weight loss achieved in the intensive treatment arm compared with the control group reduced the incidence of very high risk (CKD; from the 2013 Kidney Disease Improving Global Outcomes classification) by 31% (24). The fact that achieving or maintaining reduced body weight is often unsuccessful in the overweight or obese T2D population highlights the relevance of glucose-lowering agents that induce weight loss (2), especially because many of the currently available glucose-lowering drugs are associated with weight gain. Clinical trials with SGLT2 inhibitors in patients with T2D showed significant weight reductions of about 1.7 kg or 2.4% compared with placebo (14). 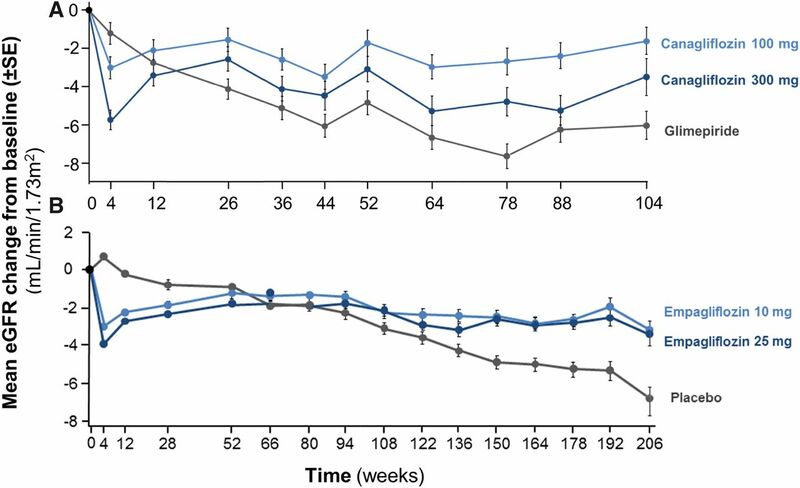 A fast decline in body weight is seen during the first weeks of treatment and likely caused by SGLT2 inhibitor–associated osmotic diuresis (25). Then, body weight declines more gradually toward 20 weeks, which is most probably related to reductions in body fat mass (26), and subsequently, it reaches a plateau phase. Interestingly, empagliflozin-treated patients with T2D lost only 3.2 kg after 90 weeks of treatment, whereas on the basis of the calories lost with observed glycosuria (approximately 240–320 kcal/d), the weight loss should have been 11 kg (27). This could be explained by a 13% compensatory increase in caloric intake and confirms earlier findings in diet-induced obese rats (28). Therefore, combining SGLT2 inhibition with strategies that reduce appetite and caloric intake (e.g., glucagon-like peptide-1 receptor agonists) may further enhance body weight reduction in T2D. T2D is frequently associated with systemic hypertension, which contributes to the high risk for DKD and cardiovascular events. Although strict BP control is widely recommended (2), the fact that it proves difficult to reach therapeutic targets (usually <140/90 mmHg) in daily practice emphasizes the need for additional BP-lowering strategies (4). SGLT2 inhibitors may be helpful in this regard, because they reduce systolic and diastolic BP by 3.77 and 1.75 mmHg, respectively, compared with placebo and 4.45 and 2.01 mmHg, respectively, compared with other glucose-lowering agents without a potentially harmful increase in heart rate (14). However, because patients in the EMPA-REG OUTCOME Trial were well controlled at baseline (approximately 135/76 mmHg), the modest BP reductions achieved with empagliflozin do not seem sufficient to fully explain improved renal and cardiovascular outcome, especially because the Action to Control Cardiovascular Risk in Diabetes (ACCORD) Trial did not show significant benefit of strict systolic BP control (<120 versus <140 mmHg) (29). The mechanisms by which SGLT2 inhibitors reduce BP remain incompletely understood, although several have been proposed. First, the glycosuria-accompanied osmotic diuresis, resulting in excess urine output by about 200–600 ml/d, may reduce BP by decreasing intravascular volume. In line with this hypothesis, dapagliflozin reduced 125I-albumin–measured plasma volume by 7.3% and increased hematocrit 2.2% after 12 weeks (25). Also, the empagliflozin-induced systolic BP reduction of approximately 4 mmHg was paralleled by a 5% increase in hematocrit after a median follow-up of 3.1 years, indicating a sustained effect on volume status (6). Second, because SGLT2 inhibitors also decrease sodium reabsorption in the proximal tubule, potentially by inhibiting the sodium/hydrogen exchanging channel isoform 3 (30), these agents can be regarded as proximal diuretic. Illustratively, dapagliflozin in RAS inhibitor–treated patients with T2D reduced placebo-corrected seated systolic BP less effectively in patients who were additionally using thiazide diuretics (−2.38 mmHg) compared with β-blockers (−5.76 mmHg) or calcium channel blockers (−5.13 mmHg) (31). Assuming that drugs with a similar mode of action have less combined efficacy, this suggest that inhibiting sodium reuptake contributes to the BP-lowering effect of SGLT2 inhibitors (31). Natriuresis is dose dependently induced by dapagliflozin during the first 24 hours in healthy volunteers but returns to baseline after 13 days of intervention (32), probably due to compensatory sodium uptake in the tubule, which is similarly observed with thiazide treatment. Interestingly, the antihypertensive effect of SGLT2 inhibitors has been shown to be independent of GFR, indicating that other factors then volume depletion also contribute (16,17). These may include upregulation of angiotensin 1–7 (33) and reductions in SUA (see below), arterial stiffness, body weight, oxidative stress, inflammation, salt storage in the glycocalyx, and sympathetic nervous system tone (34–36). Although lowering LDL cholesterol is widely used to reduce the risk for CVD in T2D (2), data concerning the renoprotective effect of LDL cholesterol lowering are conflicting (1). Modest increases in plasma LDL (1.5%–6.3%) and HDL (5.5%–9.2%) cholesterol concentrations (with no change in HDL-to-LDL ratio) and reductions in triglyceride levels (1.0%–9.4%) have been consistently observed with different SGLT2 inhibitors in clinical T2D trials (36). The improvement in triglyceride-HDL balance may be related to weight loss and improved insulin sensitivity, whereas the rise in LDL could be explained by the switch in energy metabolism from carbohydrate to lipid utilization (19). However, the precise etiology of the LDL cholesterol increase remains unknown, although it could be speculated that the clinical relevance is perhaps small given that it was accompanied by cardiovascular benefit in the EMPA-REG OUTCOME Trial. The kidney is responsible for approximately 70% of uric acid elimination. Because insulin resistance and hyperinsulinemia reduce renal excretion of uric acid, hyperuricemia is frequently observed in T2D (37). Accumulating evidence indicates that increased SUA levels contribute to the development of renal disease and CVD (37). Agents that lower SUA through inhibition of the enzyme xanthine oxidase (e.g., allopurinol) may improve hypertension and reduce GFR decline, but these effects are still being investigated in humans, and it is unclear whether they are mediated by SUA lowering per se (37). By increasing glucose concentrations in the filtrate, SGLT2 inhibition is proposed to cause glucose transporter 9 isoform 2, which is located more distally in the proximal tubule, to excrete more uric acid in exchange for glucose reuptake and also, lead to reduced uric acid reabsorption in the collecting duct (38). Where thiazide and loop diuretics reduce uric acid excretion, causing SUA levels to rise, SGLT2 inhibitors have consistently been shown to reduce SUA in T2D by 0.3–0.9 mg/dl (6,39,40). Indeed, the BP- and SUA-lowering efficacies of dapagliflozin are less when combined with thiazide diuretic treatment compared with other antihypertensives (31). However, in the EMPA-REG OUTCOME Trial, small SUA reductions alone unlikely explain the observed renal and cardiovascular benefits. Glomerular hyperfiltration, which is closely related to increased intraglomerular pressure, is a detrimental process in the diabetic kidney that occurs on the whole-kidney or single-nephron level, and it is caused by a complex interplay of diabetes-induced structural and (hemo)dynamic changes (41). Through inducing barotrauma and shear stress, it promotes albuminuria and likely contributes to the development and progression of DKD (42). In addition to lowering systemic BP, RAS blockers also favorably affect intraglomerular pressure by reducing efferent arteriolar tone. This leads to an initial rise in serum creatinine that, up to 30%, is strongly associated with long-term renoprotection (43). Similarly, SGLT2 inhibitors induce a rapid eGFR decline during the first weeks of treatment, after which eGFR slightly increases toward baseline and then, stabilizes. 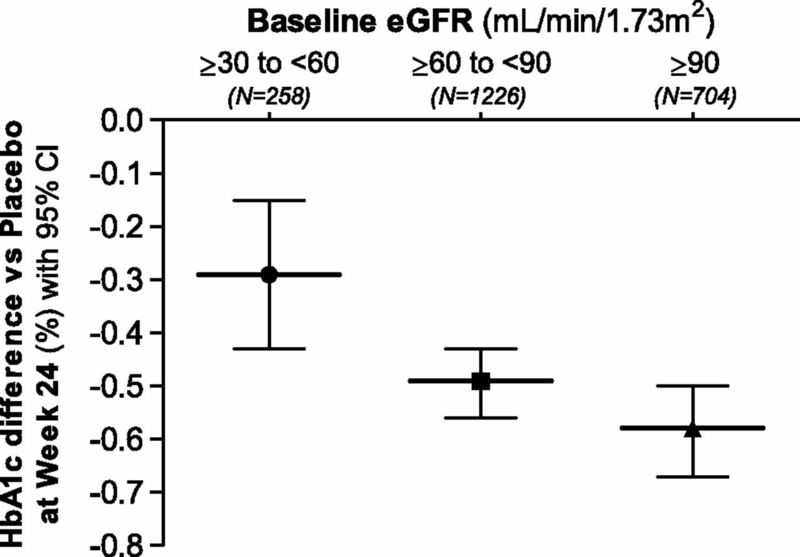 Because renal function decreases in the natural course of DKD, this eGFR trajectory indicates that SGLT2 inhibitors provide long-term renoprotection compared with placebo (5) and glimepiride (Figure 3) (44). Moreover, SGLT2 inhibition also reduces albuminuria, which not only may be a marker of nephropathy but also, is speculated to directly confer renal damage (1). In hypertensive patients with T2D and normal renal function and albuminuria (75% microalbuminuria), dapagliflozin reduced albuminuria by 33% compared with placebo (45). Also, empagliflozin reduced the progression to macroalbuminuria by 38%, whereas 80% of the population was using RAS blockers at baseline (5). SGLT2 inhibitors induce stabilization of eGFR trajectory when compared to SU or placebo. This figure is on the basis of data from long-term follow-up of (A) the efficacy and safety of canagliflozin versus glimepiride in patients with type 2 diabetes Inadequately controlled with metformin (CANTATA-SU) Trial (44) and (B) the Randomized, placebo-controlled cardiovascular outcome trial of empaglifozin (EMPA-REG OUTCOME) Trial (5). A shows that the initial eGFR drop after 4 weeks of treatment, seen with both doses of canagliflozin, prevents long-term eGFR decline compared with glimepiride. The same effect is seen in B, where empagliflozin is compared with placebo. SGLT2 inhibition, thus, prevents deterioration of renal function, which often occurs in type 2 diabetes over time. The presumed reduction in (single-nephron) hyperfiltration and associated albuminuria with SGLT2 inhibitors (1) could be explained by increased sodium delivery at the macula densa and subsequent activation of tubuloglomerular feedback (30), which increases afferent arteriolar tone and may, in turn, reduce intraglomerular pressure. In accordance, an elegant trial in 40 patients with type 1 diabetes (T1D) showed that 8 weeks of empagliflozin treatment in hyperfiltering patients normalized inulin-measured GFR during clamped euglycemia (GFR=172±23–139±25 ml/min per 1.73 m2). This was accompanied by an increase in fractional sodium excretion, and these changes did not occur in normofiltering patients (46,47). A subsequent post hoc analysis confirmed that the amelioration of hyperfiltration was likely caused by a reduction in intraglomerular pressure as a consequence of increased afferent arteriolar tone (47). However, because intraglomerular pressure cannot be directly measured in humans, it has to be estimated by using variables, such as GFR, BP, and renal blood flow, using the Gomez equations (48). SGLT2 inhibitors are well tolerated and do not seem to increase hypoglycemia risk (21). The adverse effects that have been reported, like genital/urinary tract infections (UTIs) and ketosis and volume depletion in the presence of predisposing factors, have also been seen in patients with familial renal glycosuria and have generally been mild (12). Currently, there are no data available on SGLT2 inhibitors in patients with diabetes and an eGFR<30ml/min per 1.73 m2, in whom glucose-lowering efficacy is less, and safety issues, like electrolyte disturbances and acute renal failure, could be expected more frequently in this population. The most commonly observed adverse effects of SGLT2 inhibitors are genital infections and UTIs. The RRs for genital infections (candida) were 4.75 in regulatory submissions (95% CI, 4.00 to 5.63) and 2.88 in scientific reports (95% CI, 4.48 to 3.34), which were both assessed in a 2016 meta-analyses, and they are more pronounced in women (19). The reported RRs of UTIs were 1.15 in regulatory submissions (95% CI, 1.06 to 1.26) and 1.02 in scientific reports (95% CI, 0.95 to 1.10) (14,21). Empagliflozin did not increase the RRs for UTIs in the EMPA-REG OUTCOME Trial and importantly, complicated UTIs (6). An increased risk of hypovolemia has been observed with the use of SGLT2 inhibitors in T2D, especially in older patients or those treated with diuretics, with RRs of 1.53 in regulatory submissions (95% CI, 1.27 to 1.83) and 1.16 in other eligible papers (95% CI, 0.98 to 1.38) (21). However, a meta-analysis of dapagliflozin trials did not find an increased risk for acute renal toxicity or deterioration of renal function (49), and empagliflozin has even been found to reduce this risk (6), which confirms the findings in familial renal glycosuria (12). No relevant electrolyte disorders have been reported in the EMPA-REG OUTCOME Trial (6), and a dedicated analysis only found mild hypokalemia to be more common with dapagliflozin, whereas the risk for hyperkalemia and severe hypokalemia was not increased (50). Other potential adverse effects of SGLT2 inhibition are bone fractures. No increased fracture risk was found in a major meta-analysis from 2016 (21), but in a trial with patients with T2D and moderate renal impairment, 9.4% of patients experienced a bone fracture after 104 weeks of 10 mg dapagliflozin treatment, whereas no fractures occurred in the placebo group (16). It has been hypothesized that increased sodium concentrations in the tubule drive cotransport of sodium and phosphate, leading to increased serum phosphate levels, as has been observed (51), which in turn, increase PTH secretion and FGF23 secretion by osteocytes. Together with the fact that SGLT2 inhibition may decrease 1,25-dihydroxyvitamin D, this may negatively affect bone health (52). The evidence for this hypothesis is, however, brittle, and data are conflicting. A dedicated randomized, placebo-controlled trial in patients with T2D inadequately controlled with metformin monotherapy found no changes in serum calcium, 25-hydroxy vitamin D, parathyroid hormone, markers of bone formation/resorption, bone mineral density, or fractures during 50 weeks of dapagliflozin treatment (53). Recent reports linked SGLT2 inhibitors to the development of (euglycemic) diabetic ketoacidosis (DKA). The DKA risk is evident in T1D, where 4.3% and 6.0% of patients who received canagliflozin treatments of 100 and 300 mg, respectively, developed serious DKA that required hospitalization, whereas no ketone-related events occurred in the placebo group during an 18-week randomized, controlled trial including 351 patients with T1D (54). However, it is unlikely that SGLT2 inhibition–related DKA is a major safety concern in T2D. As such, (preliminary) analyses from major cardiovascular safety trials did not show an increased risk for DKA (6,55). Plausible mechanisms through which SGLT2 inhibition could increase this risk include a reduction in (exogenous) insulin levels, increased glucagon levels, and volume depletion, which lead to decreased glucose oxidation, increased fat oxidation, and thus, stimulation of ketone body formation (19) on top of increased renal ketone body reabsorption (56). Uncontrolled preregistration trials suggested that dapagliflozin might increase the incidence of bladder and breast cancers, although the former could be a result of detection bias due to routine urine sampling. Although long-term data are still needed to draw definitive conclusions, pooled data from a large number of clinical trials recently suggested that SGLT2 inhibition may lower the overall cancer risk in T2D (21). Lastly, the EMA and the FDA recently issued a review on an increase in lower-limb amputations (three versus six events per 1000 patients), mostly affecting toes, in the ongoing placebo-controlled canagliflozin cardiovascular outcome trial Canagliflozin Cardiovascular Assessment Study, whereas a nonsignificant increase in the number of amputations occurred in the renal Canagliflozin Cardiovascular Assessment Study–Renal (CANVAS-R), in which patients with T2D have now been followed for an average of 9 months. Although no increase in such amputations was seen in 12 other completed clinical trials with canagliflozin, this potential safety issue will be closely evaluated in the near future. Dedicated outcome trials with predefined renal end points will need to confirm the renal benefit found in the EMPA-REG OUTCOME Trial in patients with T2D. Currently, the CANVAS-R and the Canagliflozin and Renal Events in Diabetes with Established Nephropathy Clinical Evaluation Study are assessing the effect of long-term canagliflozin treatment in high–CVD risk patients with T2D on renal outcome and expected to report in 2017 and 2019, respectively. If renoprotection by SGLT2 inhibitors is confirmed in a population with eGFR>30 ml/min per 1.73 m2, a next step could be to assess safety and the potential to improve renal outcome in patients with more advanced DKD, because some beneficial effects do not seem to be related to GFR. The results of ongoing large-sized safety trials with different SGLT2 inhibitors (Table 4) are also eagerly awaited to confirm cardiovascular benefit, assess potentially increased stroke risk, and clarify whether the benefits in the EMPA-REG OUTCOME Trial are drug specific or may be regarded as a class effect. Furthermore, it is important to know whether these finding can be translated to patients without established CVD, which will be assessed in the Dapagliflozin Effect on Cardiovascular Events Study, or whether SGLT2 inhibition could provide renal benefit in patients with CKD not related to diabetes. Given the insulin-independent mechanism of action of SGLT2 inhibitors, these agents are currently under investigation as an adjunct to insulin therapy to improve glycemic control in T1D. Also, plasma glucose, BP, and body weight could be synergistically lowered by combining SGLT2 inhibition with glucagon-like peptide-1 receptor agonists (57), which suppress glucagon secretion and reduce appetite, and this combination is currently being investigated. Furthermore, compounds that partially inhibit SGLT1 in addition to complete SGLT2 inhibition are being developed to increase the effect size of specific SGLT2 inhibitors without causing the (intolerable) gastrointestinal side effects of specific SGLT1 inhibitors. Lastly, the beneficial pleiotropic effects of SGLT2 inhibitors could also be exploited to prevent or delay the onset of T2D and treat heart failure, hypertension, obesity, and CKD in patients without diabetes. Despite the intensified multifactorial treatment in T2D, traditional risk factors are usually inadequately controlled in daily practice, and DKD as well as CVD remain common complications that have a major effect on global health care. SGLT2 inhibitors are novel antihyperglycemic drugs that effectively reduce glucose by stimulating urinary glucose excretion, while simultaneously improving multiple other risk factors in a glucose-independent manner. Collectively, these effects resulted in a remarkable improvement of renal and cardiovascular outcomes. Ongoing outcome trials and future mechanistic studies will have to confirm these findings, elucidate the mechanisms through which SGLT2 inhibitors improve outcome, and determine their place in the glucose-lowering armamentarium to optimally minimize the burden of the expanding diabetes epidemic. We searched Medline, PubMed, Google Scholar, and the Cochrane library for English language abstracts and full-text articles published before June of 2016. The search for this review has mainly focused on clinical studies (cohort studies; randomized, controlled trials; and meta-analyses of randomized, controlled trials). The keywords used included “SGLT2 inhibitor,” “sodium-glucose cotransporter-2 inhibitor,” “canagliflozin,” “empagliflozin,” “dapagliflozin,” “sotagliflozin,” “ertugliflozin,” “ipragliflozin,” “tofogliflozin,” “luseogliflozin,” “Remogliflozin etabonate,” “Henagliflozin,” “diabetic kidney disease,” “diabetic nephropathy,” “renoprotection,” “cardiovascular disease,” “diabetes” “clinical management.” These keywords were used as single search terms and in combinations. We also searched the reference lists of original articles, narrative reviews, clinical guidelines, and previous systematic reviews and meta-analyses for further relevant material. Through M.H.H.K., the VU University Medical Center received research grants from AstraZeneca (Cambridge, UK), Boehringer Ingelheim (Ingelheim, Germany), Novo Nordisk (Bagsvaerd, Denmark), and Sanofi (Gentilly, France). M.N. has received an unrestricted research grant from AstraZeneca and lecture fees from Astra Zeneca, Eli Lilly (Indianapolis, IN), Sanofi, MSD (Whitehouse Station, NJ), Danone (Paris, France), and Johnson & Johnson (New Brunswick, NJ). The other authors declare no competing interests.